We are celebrating "Chakra Meditation Month", for entire February. 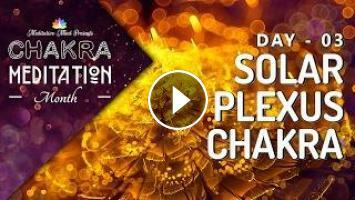 On Day 03 of this special Chakra Meditation Series we are continuing with Chakra Sleep Meditation Music, featuring Solar Plexus Chakra(Manipura) Deep Sleep Meditation. Week 4 : Chakra Balancing & Healing Music. It is located just above the naval and below the rib cage. When this Chakra is in balance you will know without a doubt, and accept your place in the Universe, have self-love and, in turn, have a great appreciation for all the people in your life and the uniqueness that they bring to world. When in tune, your Solar-plexus will radiate warmth and joy through-out your entire being, and to others who come into contact with you. The color Associated with this Chakra is Yellow and its Sanskrit Name is Manipura. LET'S CONNECT - Meditation Music, Mantra Meditations, Chakra Healing Chants & Healthy Living Tips. Copyright ⓒ 2017 Meditative Mind.